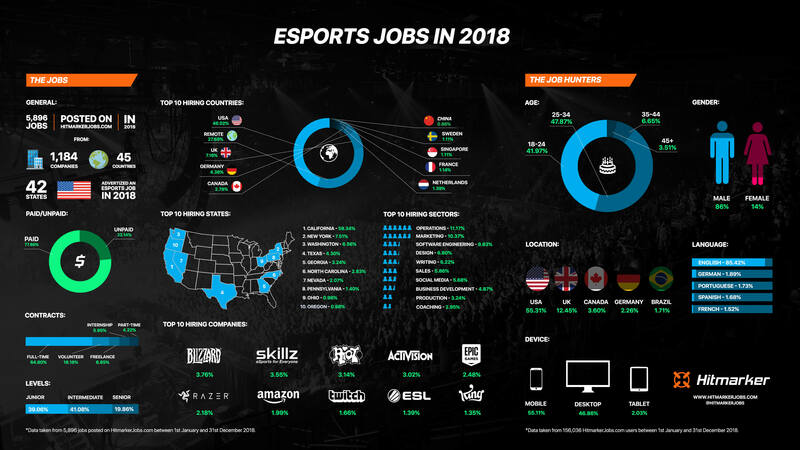 UK-based esports jobs website HitmarkerJobs.com has released an infographic that displays the job opportunities in the industry from 2018. Almost 6,000 esports opportunities were posted on the platform over the course of the year. The digital nature of video games and esports enables opportunities on a global basis and this was reflected in the data that was collected. A total of 5,896 esports jobs were posted on the website and they came from 45 different countries across five continents. It’s no secret that there are a lot of amateur organisations and companies that inhabit the industry, and with that typically comes a plethora of unpaid roles and opportunities. The data collected by HitmarkerJobs.com, however, displays that over three quarters of jobs posted were paid and two thirds of those paid jobs offered a full-time contract. The data presented displays a plethora of further interesting insights, from a steady rise in female job hunters, to the average age range of those looking for an opportunity in esports, to the industry’s top hiring sectors. Click on the graphic above to get a better look at the interesting insights from the available esports opportunities in 2018! Esports Insider says: There’s a lot of talk about how the esports industry is growing but that can be interpreted in ways other than revenue it’s bringing in – one of those ways has to be the opportunities that are available to work in it. HitmarkerJobs.com’s transparency gives us a great idea as to how growth is being witnessed in terms of esports jobs and, as you’d expect, we’re happy to see it.